The committee was already turning its attention to making the 2008 Pride event bigger and better. Devon and Cornwall’s first major Pride event was attended by thousands of people and now organisers want to make it an annual event, with even bigger and better plans for 2008.
plymouth prideevent 2007 featured a long weekend of fun activities, ranging from sumo wrestling and line dancing to a bouncy castle and a picnic on Dartmoor alongside LGBT information, advice, and support services. The event engaged people from all walks of life in a festival-type atmosphere, which centred on activities throughout the Saturday in Plymouth Guildhall. More than a thousand people attended the Guildhall events, which were officially opened by the city’s Deputy Lord Mayor and Mayoress. Many more took part in events held in venues in and around the city during the weekend, including a football tournament, a karaoke contest, and church thanksgiving service, and a local heat of Mr Gay UK. In the Guildhall itself, there were two gigs by the UK’s hottest new boy band, Code 5, who recently supported Westlife’s nationwide tour, as well as local artists and entertainers. A BBC Question Time-style formal debate was held on LGBT issues and featured the city council leader, a high-ranking police officer, and representatives from the city’s health and commercial sectors. plymouth prideevent 2007 committee secretary Jan Netherton said the positive involvement of the city council, the police, and other agencies and local businesses, was one of the most pleasing aspects of the occasion. She praised local and regional media across Devon and Cornwall who reported the event in an upbeat and responsible way, which had helped to raise a public awareness of LGBT issues in the community. Now, the committee was already turning its attention to making the 2008 Pride event bigger and better. 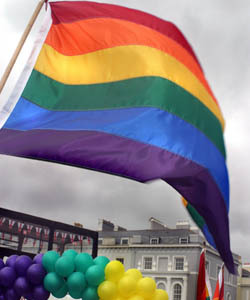 A fortnight earlier, the Pride committee also had a float, which took part in the city’s annual Lord Mayor’s Day Parade through the city centre streets, together with two other floats organised by gay pubs.